Here is the ideas page for Google Summer of Code 2019. We encourage interested students to contact mentors to discuss these ideas or propose new ones. The Moira team would appreciate your contributions. Moira is a realtime alerting system based on Graphite data. The source code is licensed under MIT. Explanation. 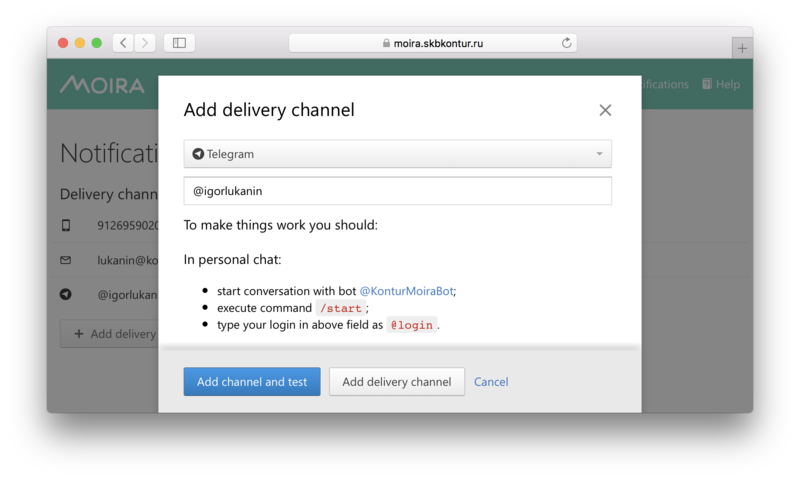 Moira supports a number of delivery channels such as email, Slack, Telegram, etc. to inform users that a certain trigger was activated (see Setting Up Your Subscriptions). The aim of this project is to provide support for a number of additional delivery channels. To do so, one should talk to community and research possible channels to be added, contribute corresponding senders, and tune the web UI to allow users to create subscriptions using new channels. Code reference. See email sender source code or Pushover sender source code. Expected outcome. Some qualitative or quantitative data on channel popularity is collected. 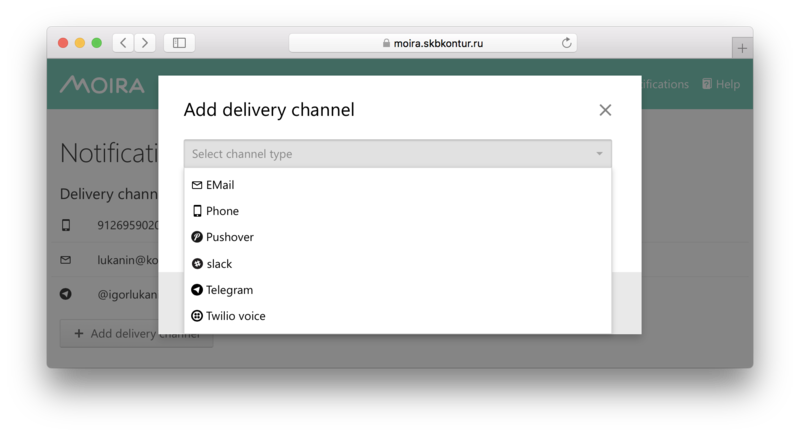 Several delivery channels are added to Moira and released. Mentors. Alexey Kirpichnokov (alexkir@kontur.ru), Alexander Sushko (sushko@kontur.ru). Explanation. Moira’s users are able to set up new delivery channels and contacts to be used with those channels. However Moira doesn’t check if the channel configuration is valid and alerts can be actually sent. A user may provide a non-existent Slack user name, block Moira’s bot in Telegram, etc. As a result, such user wouldn’t be able to receive alerts. The bad thing is that sometimes invalid configuration would cause Moira’s bots to be banned for a certain period of time. This effectively means a denial-of-service for alerts which is highly undesirable. The aim of this project is to implement health checks when delivery channels and contacts are set up. To do so, one should enhance the delivery channel and contact setup flow: send a test alert, verify that it’s received, don’t let to save an invalid configuration otherwise. Certain modifications of the web UI may be required. Code reference. See contact API source code and subscription API source code. Expected outcome. Health checks are implemented and released. Mentors. Arkady Borovsky (borovskyav@kontur.ru), Timur Kamaev (kamaev@kontur.ru). Explanation. Moira’s web UI is nice and widely used. However, users don’t always want to create triggers, subscriptions, and contacts manually. They would like to be able to automate routine tasks with the tools like Ansible which they already use to bootstrap database and application clusters. For this kind of automation, Moira should have a well-documented API and a number of client libraries for all popular languages. At this point, Moira doesn’t have any API documentation. To use the API, one should study Moira’s source code or an existing client library source code to understand how the API works and reverse-engineer contracts of its methods. The aim of this project is to provide an always up-to-date documentation of Moira’s API and a few client libraries. To do so, one should create an OpenAPI description of API, generate a number of client libraries for popular programming languages with Swagger tools, and setup a process so the documentation and the clients are updated when a new API version is released. Code reference. See Moira’s API source code and the Python client library source code. Required skills. General Go or Python skills. Familiarity with OpenAPI or Swagger would be a plus. Expected outcome. Moira’s documentation has a link to a human-readable API documentation. Client libraries are released (not required). There’s a process in place to update the documentation and the clients on API changes. Mentors. Arkady Borovsky (borovskyav@kontur.ru), Alexey Kirpichnokov (alexkir@kontur.ru). Explanation. Moira is based on Graphite data, and Graphite is often used with Grafana to visualize metrics. When a graph for a certain metric is set up in Grafana and some thresholds are specified, users would like to be able to create a corresponding trigger for this metric in Moira. The aim of this project is to provide a way to create triggers in Moira from Grafana’s web UI with the minimum effort possible. To do so, one should create a Grafana plugin which changes its web UI and provides controls to send trigger data to Moira. Certain modifications of Moira’s trigger creation interface would be required. Code reference. See Moira’s web UI source code. Expected outcome. The plugin is implemented and contributed to Grafana plugin directory. Mentors. Arkady Borovsky (borovskyav@kontur.ru), Alexander Sushko (sushko@kontur.ru). The aim of this project is to migrate Moira’s web UI source code from Flow to TypeScript. To do so, one should analyze the code base, propose a migration strategy, actually rewrite the code, and change the build process if needed. Expected outcome. Moira’s web UI source code is migrated to TypeScript. A new major version of Moira’s web UI is released. Mentors. Alexander Sushko (sushko@kontur.ru), Arkady Borovsky (borovskyav@kontur.ru). Explanation. Nowadays, Moira’s web UI uses the Retail UI library of React controls. This library is open source but has a certain niche as it was developed for products of Kontur, a large B2B SaaS company from Russia. This approach has a number of advantages: controls are designed, implemented and documented very well, there’s a handy validations library which comes with them. It also has a number of disadvantages: the design of controls is hard to tune (thus, no chance to have UI themes in Moira), the controls have bullet-proof implementations with polyfills (thus, no chance to reduce bundle size), and only few controls are actually used in Moira. The aim of this project is to migrate Moira’s web UI to native controls. To do so, one should analyze the code base, understand the pros and cons, and actually migrate the code if it’s better for Moira. Expected outcome. Moira’s web UI is modified to use native UI controls. There’s no dependency on the Retail UI library. A new major version of Moira’s web UI is released.